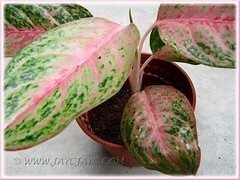 Aglaonema or popularly known as Chinese Evergreen, being first cultivated in China, is one of the most decorative indoor plant with attractive variegated foliage for homes and offices. With much hybridizing over the many decades, especially in Thailand and Indonesia in Southeast Asia, the newer cultivars are now available in explosive colours with many variations in shades, forms and sizes. 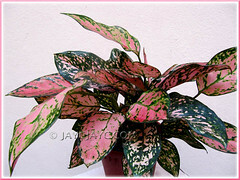 One such new hybrid from Thailand is Aglaonema ‘Valentine’ with lovely pink and green random blotches as pictured above. 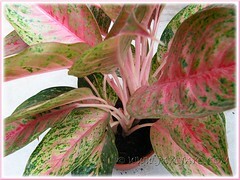 Our potted Aglaonema cv. Legacy another beautiful Thai hybrid, that was purchased in June with four young shoots had become somewhat large for the small 6-inch diameter pot. We could either repot them altogether into a single larger pot or divide and grow them individually to get more plants. We opted for the former choice but took the opportunity to separate one plant from the rest for our propagation project. This is to help beginners who may be clueless on how to go about it. 1. 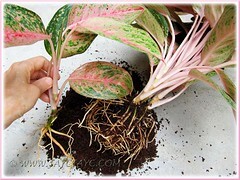 Place the pot on its side and carefully pull the plants out from the pot, removing the root ball together with as much soil as possible. 2. 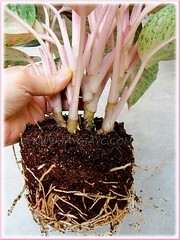 Check the condition of the roots to see whether it is rootbound or not. 3. Place each division (section) or a single separated plant into a pot of quality potting medium, firm the soil around the stem(s) and water thoroughly. 4. Locate the pot at a sunny site that receives bright indirect sunlight. Water regularly to keep the soil moist. In due time, your plants should thrive well and very likely overstay as they are long-lived. A terminal bud had emerged 3 weeks later on the plant that was separated, assuring successful propagation. New shoots or suckers are produced from the base, within 3 weeks after the clump of plants were replanted, showing they’re happy in their new and spacious home. Thanks, Gillian… it sure is a beauty! These Thai hybrids have fantastic variegation. Hi Jacqui, I don’t have it yet, it is still expensive here in the country. But we have other lesser expensive varieties though. I am sure many will benefit from this informative post. The first time I ever remember seeing this in the market was the green leave with white patches. Amazing what new breeds look like now. @ Andrea – Sometimes new hybrids are priced exorbitantly but bound to drop eventually… hope you’re able to get it for what it’s worth. Thanks for visiting. @ James – Indeed! Thanks to those hybridizers, we’re really spoilt for choice. Thanks for dropping by. I have this in my garden. I am hoping to propagate more plants by division. These plants are costly. We bought a clump of 4 plants for RM20… quite reasonable, I think. Fortunately these plants sucker freely, so ultimately they’re not that that expensive. Thanks for visit, A.Belle. Hello- I have been nurturing a cutting and it has sprouted plenty of roots and I am ready to plant this in potting soil, what size pot is best to start of with? I realize this plant is top heavy and I don’t want it to fall over. Any help is much appreciated! Probably best to start off with a 6-inch size pot and later replant it into a ceramic pot to prevent falling over. I have a Chinese evergreen plant.it has green leaves and white patches on them.I want to propogate the plant.however it is one leg stem. Please advise how is the propogatuon possible? The plant is still young. 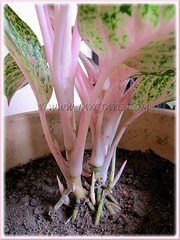 My humble advice is to allow your plant to mature further with more stems and leaves before they can be propagated. Someone gave my mother a Chinese Evergreen cutting. It’s approximately half an inch wide and just 2 inches long. Initially we did put the cutting in water because we didn’t have soil. However, we have now put it in some soil, cut side down. Will it root? How long will it take? Thank you for this formative article and answering my query. Yes, it will root. Probably in a week or two. I bought few months ago 2 plants and they are doing great. They’ve grown a lot and seem happy:) I was thinking if I should separate to create more plants, because each one is like a mini-bush, with 4-5 plants that have their own ramifications. Can I do it in summer and simply separate and repot? Yes, you can do it now if you desire. Not necessary to wait until summer. I have a full, healthy ‘Emerald Beauty’–actually it is 4 of them in a pot. It is currently staked as they are getting too tall to stand straight on their own. I’m wondering about cutting down: If I cut each stem to 2cm above the soil, I’ll be left with tops that are quite large (say, 20cm wide each) with lots of leaves. Can I just pot these tops as they are or are they too big? Do I need to trim the tops or divide into segments before attempting to root them? In my humble opinion, I’d suggest that the 20cm lengths be cut into two and remove a couple of their basal leaves before potting them. You didn’t say how to propagate with seeds, but still mentioned it? 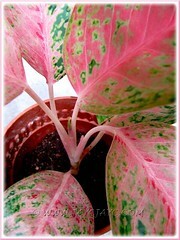 I’m not finding a website that explains how to propagate through seed for the Chinese evergreen. “Seeds of this plant can be used to propagate the species. When the fruit becomes red, it means it is ripe and must be harvested. Keep the seeds in sphagnum moss at a depth of 0.5 inch at a temperature 70-80F. If the temperature’s lower, the germination percentage is lower as well and takes longer. As a rule, the process of germination takes up to 3 months, however, if the seeds are fresh, they can germinate within 2-3 weeks. This sort of propagation is very popular, though many people prefer cutting”. Hi! I was wondering how long it would take for new growth to appear at the soil line, I was also wondering, can you propagate agleonema in water? Thanks!